One of my favourite radio interests is CW contesting and I operate in many of the European contests, usually in a QRP category. Currently, my shack is confined to a corner of the living room which limits the size and quantity of equipment that I can use. 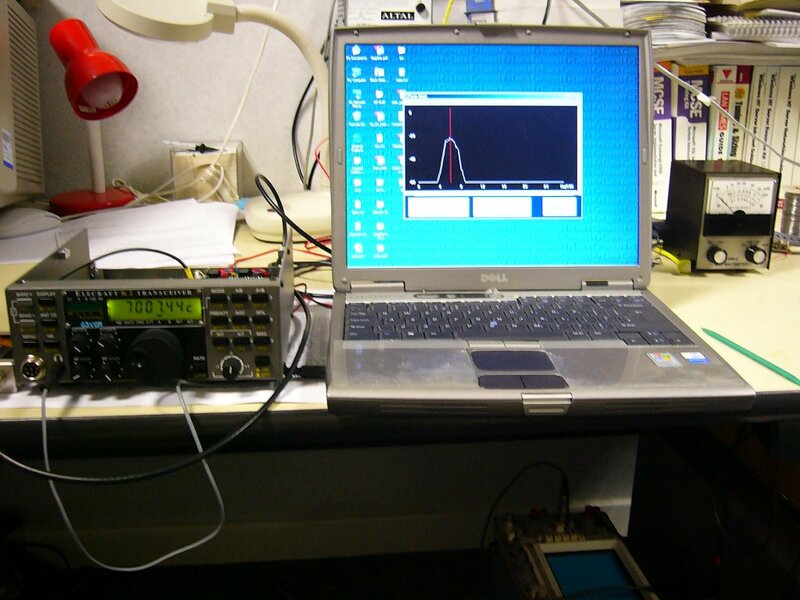 To fit the available space, I have been using an Icom IC706mkIIG, which was originally my mobile rig. Whilst this is a compact, flexible rig, the performance on the LF bands at night is quite poor compared to my IC735. Considering that the current point in the sunspot cycle means that the LF bands will be the most useful bands for the next 3-4 years, I realized that I needed to upgrade my station to operate effectively on the lower bands. 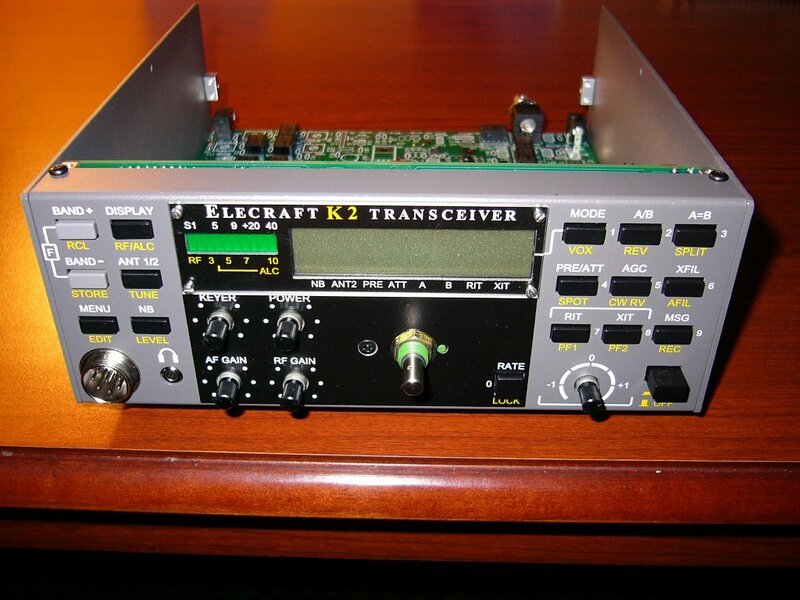 After reading many positive reviews of the Elecraft K2, it seemed this was the ideal compact CW rig and I decided to purchase a kit. 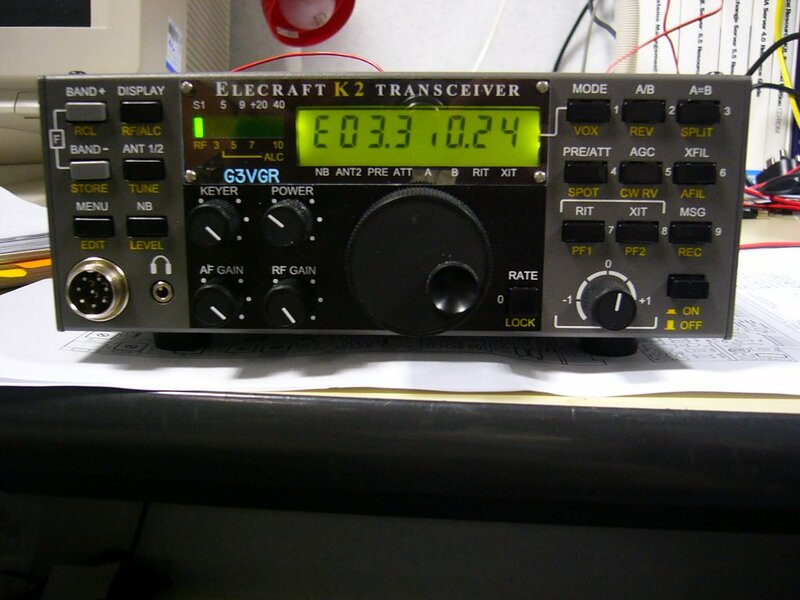 Various contesters and DXpeditioners were impressed with the K2's performance and I liked the fact that the K2 is primarily a CW rig, with SSB as an option. 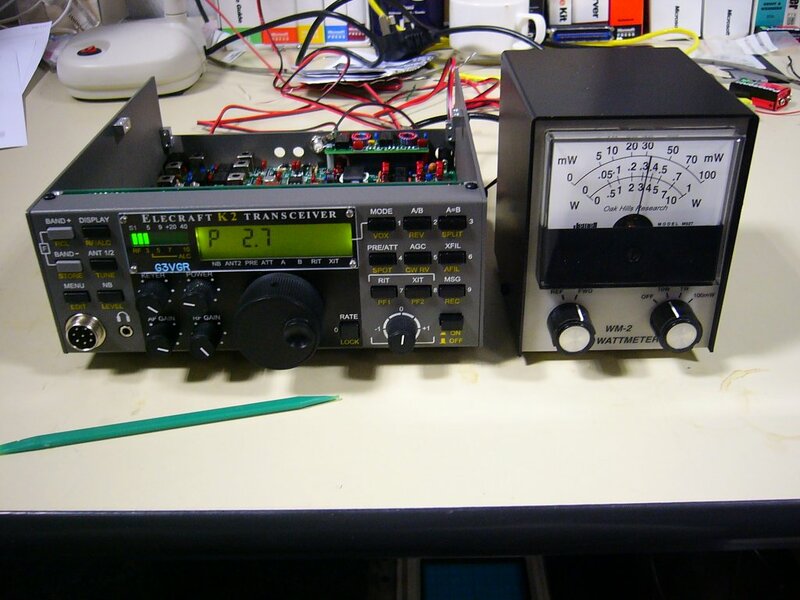 Most Japanese rigs are SSB radios with CW added as an afterthought, so have poor QSK performance, many still using relays instead of solid state T/R switches. 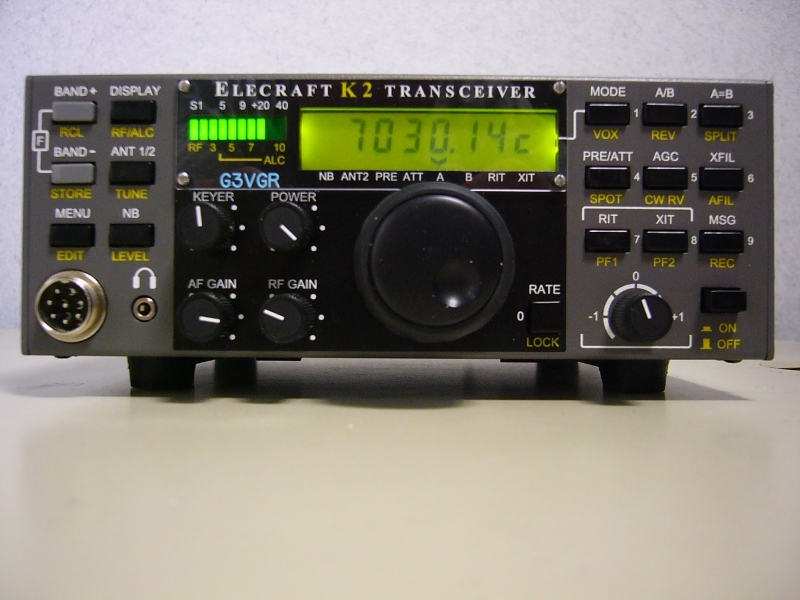 In March 2005, I went to the USA on a 3 week business trip, so ordered a K2 kit with Noise Blanker and 160 metres options and arranged for Elecraft to deliver it locally. 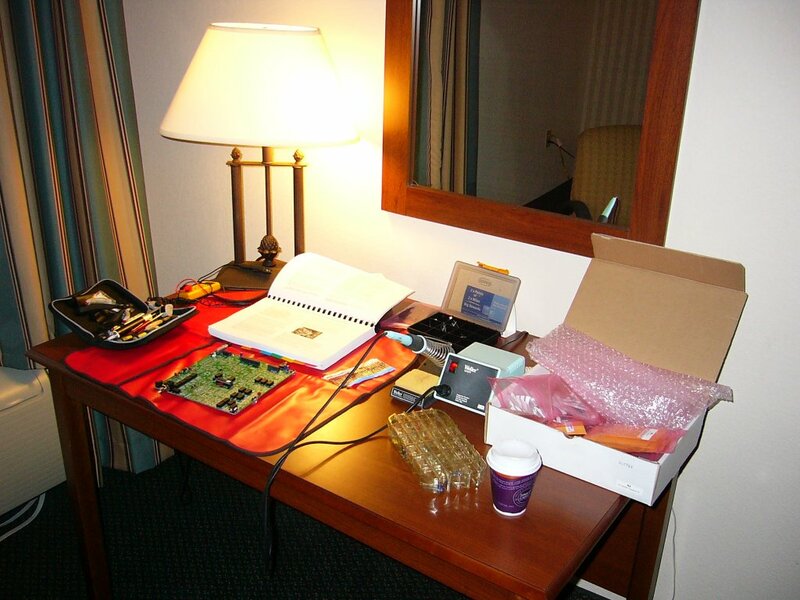 I planned to work on kit assembly during some evenings in my hotel room, so brought a few hand tools and borrowed a Weller soldering station from Willis, KB1JFG. 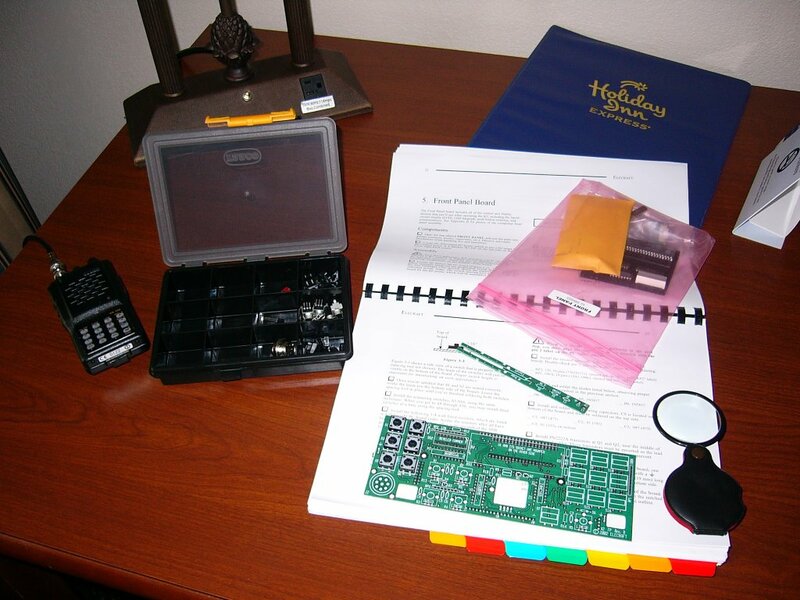 Using my hotel room as a makeshift workshop,I managed to complete the Control and Front Panel boards whilst there and also successfully pass the Stage 1 testing and alignment. The hotel room had poor lighting, so I resorted to getting up at 5AM and checking my workmanship in daylight with the sun shining through the window. 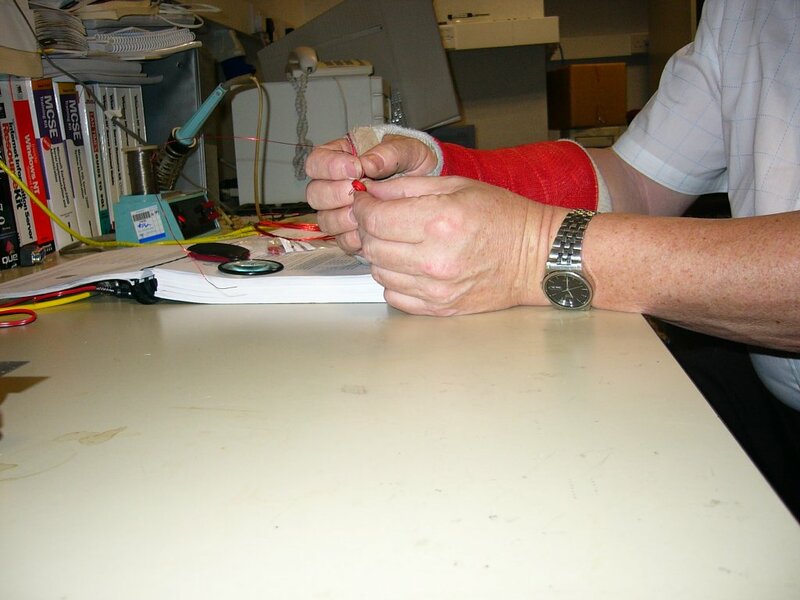 After this, I completed most of the Stage 2 assembly on the RF board, but was not able to wind the toroids, having fractured my wrist slipping and falling on an icy patch outside the W1SRG shack on the WPX SSB Contest weekend. The project was originally put on hold for four weeks, when the cast was due to be removed from my arm. After a week of inactivity, I was getting severe "construction withdrawal" symptoms and was impatient to see if the K2 would successfully complete the Part 2 testing , so I persevered at winding toroids with my clumsy right arm. Despite the handicaps I had been working under, all the Part 2 testing was successful and I was delighted to hear 40m signals on the K2. The receiver sounded great, although a little deaf because the filters had only been roughly aligned to the values in the handbook. After reading the construction steps to complete Part 3, I realized there was only less than a day's construction remaining. Instead of being happy to be close to completion, I felt a little sad, because the actual kit construction is very enjoyable. To console myself, I built the 160 metres and Noise Blanker options, then completed the K2 construction after winding more toroids. 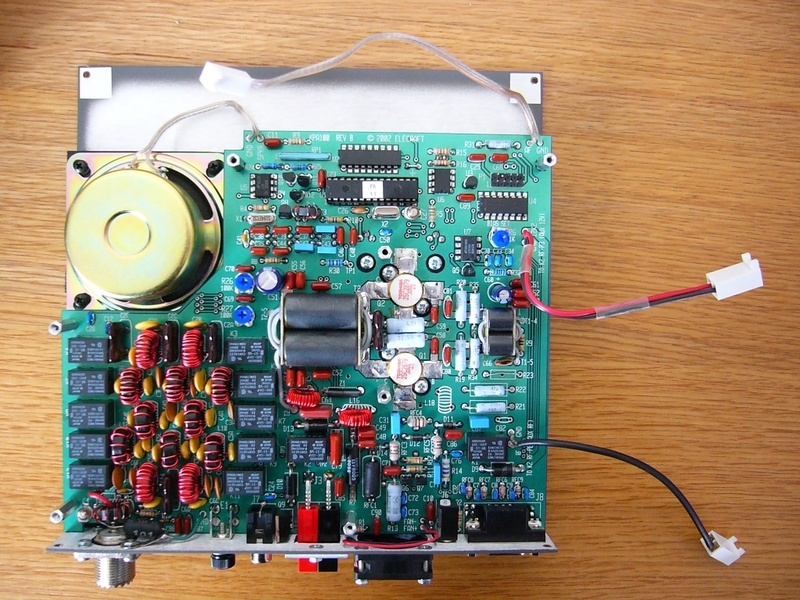 On the Part 3 testing, as well as the receiver seeming somewhat deaf on 40 metres, the transmitter went into self-oscillation when adjusting the bandpass filters. 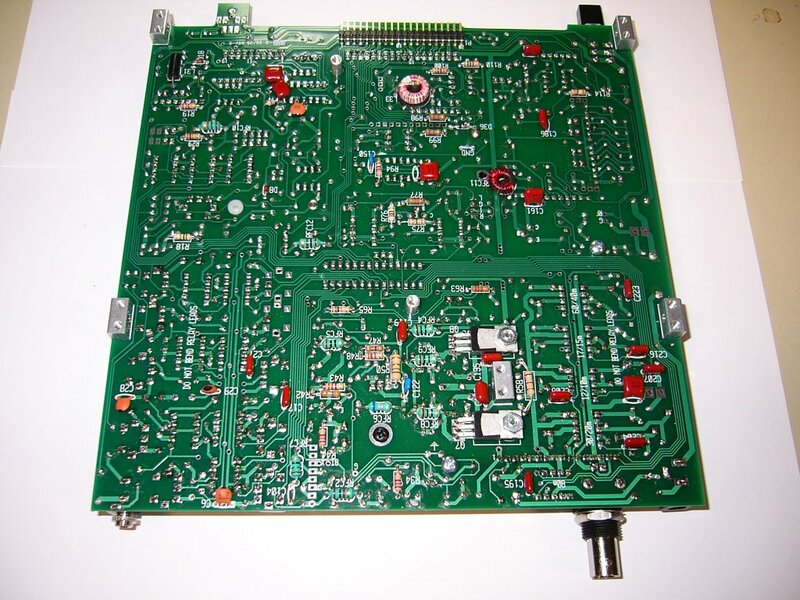 I did a quick search on the Elecraft reflector and found a few posts mentioning the xmit problem being due to the +8volts receive voltage and the T/R switch. Sure enough, the +8R was at 1.85v instead of ground during transmit. The FETs on the logic board are the usual suspects, but mine were OK. After some debugging I traced the problem to Q23 on the RF Board, which had a broken leg - possibly damaged while constructing the RF board, as it is located at the very front. 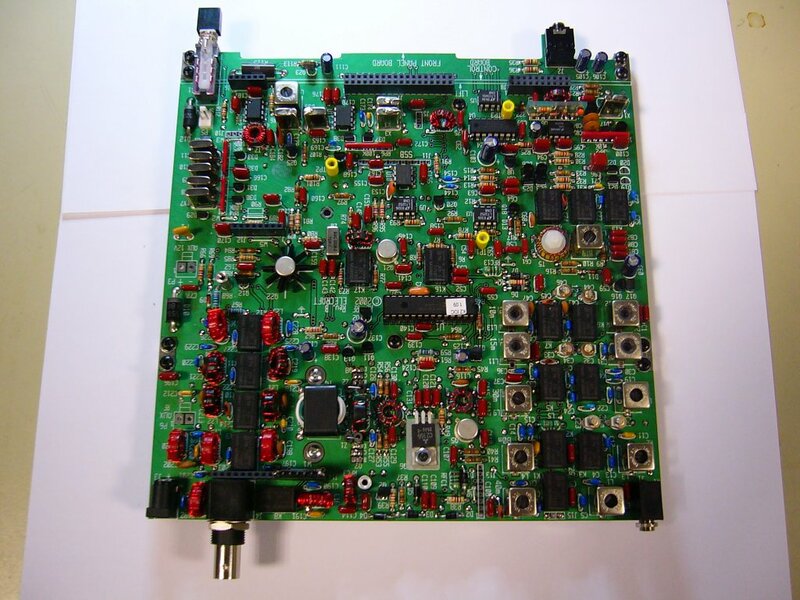 After replacing the FET, I was able to get about 14 watts output on 40 metres with no instability or overcurrents. Shortly after this success, the receiver went completely deaf on the next powerup. Using a noise generator, it seemed the post-mixer amplifier wasn't working. 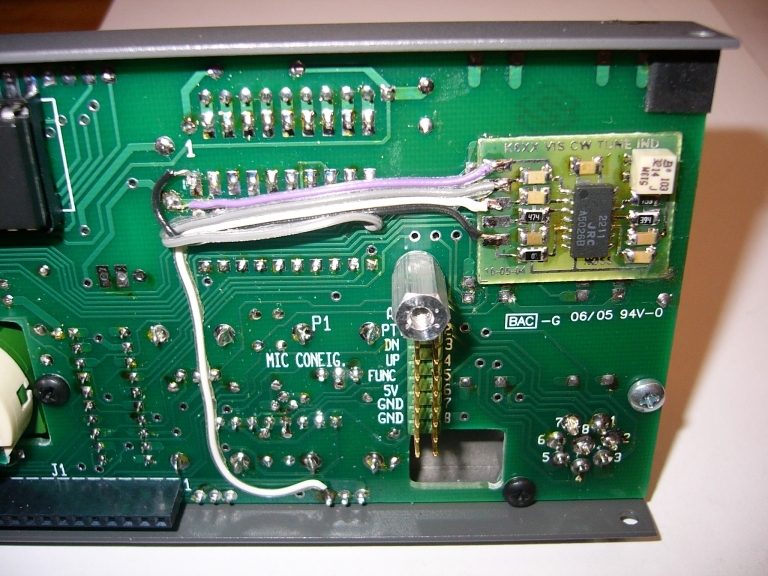 An inspection revealed an unsoldered joint on the capacitor from Q22's collector to the resistive pad. After soldering this joint, the receive path was fine, so I spent another 15 minutes re-examining all joints on the RF board for poor or missing solder, but all looks ok. From the troubleshooting, I realized that the K2 receiver is exceptionally quiet unless there is a signal present from the antenna, which really impressed me. 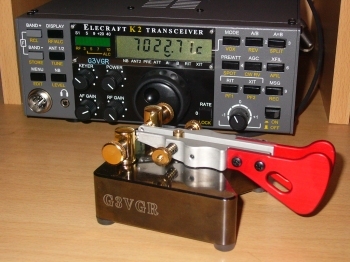 The K2 was completed in mid-May 2005 and was first used in the CQ WPX CW Contest. 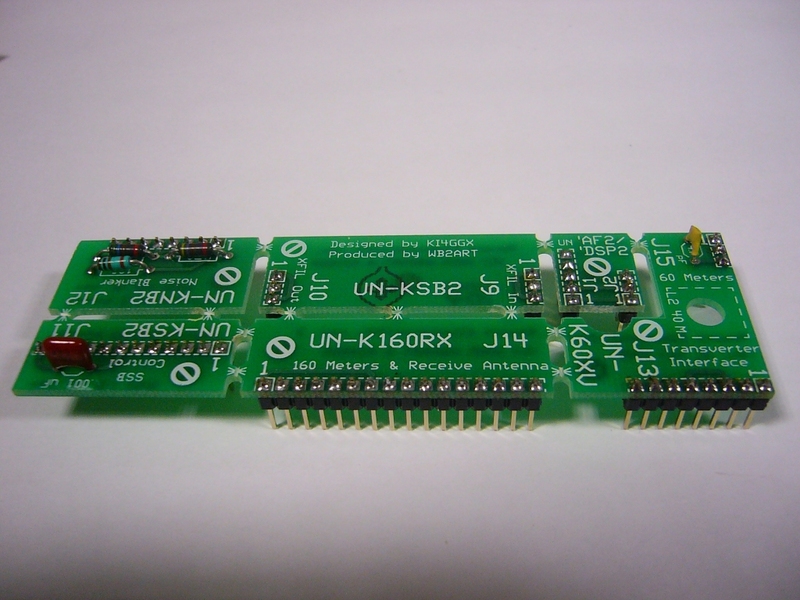 The receiver performance was oustanding compared to the IC706mkIIG. 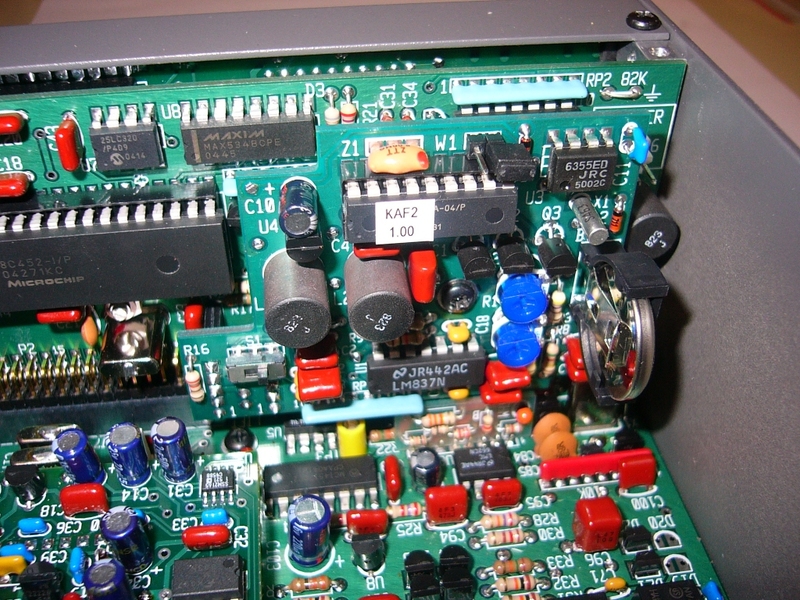 The final additional option was a KAF2 audio filter, built in December 2005. I had originally contemplated the DSP2 option, but as I already own a Timewave DSP-9X, chose the KAF2 instead. I'm glad I did as this is a very worthwhile addition for CW operators. I found it easiest to align the 2 bandpass sections by using Spectrogram. Normally, I operate CW with the AF1 section permanently enabled and it produces a pleasant sound. The Real Time Clock seems to be a fairly useless feature. It's not very accurate and it's also not too easy to set up the display. 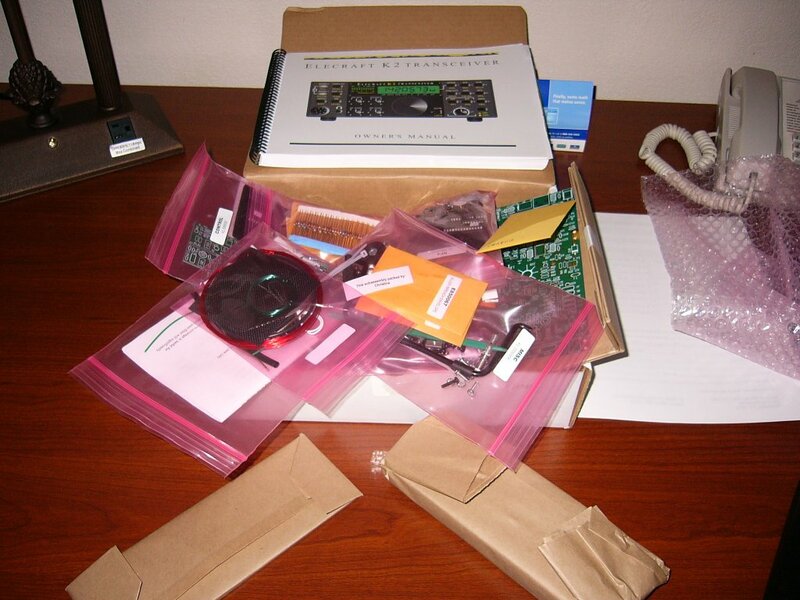 I also purchased the XG-1 Signal Generator at the same time. I used this often during 2008 to reassure myself that the RX was still working due to the bands being almost totally dead with the worst Sunspot minimum I've lived through. Now that my K2 had 4 option cards fitted, it also made sense to buy the Rework Eliminator kit from WB2ART. 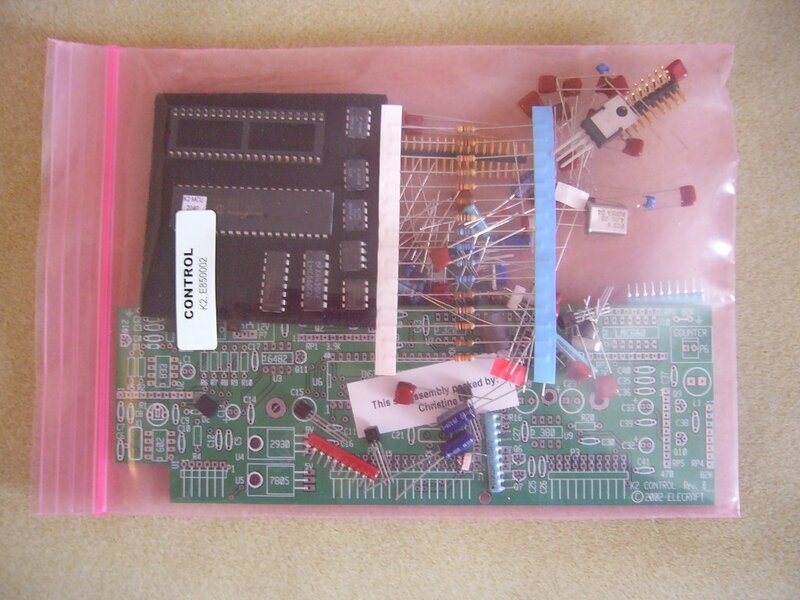 This kit allows one to remove/replace option cards without any component removal/replacement or unsoldering/resoldering. 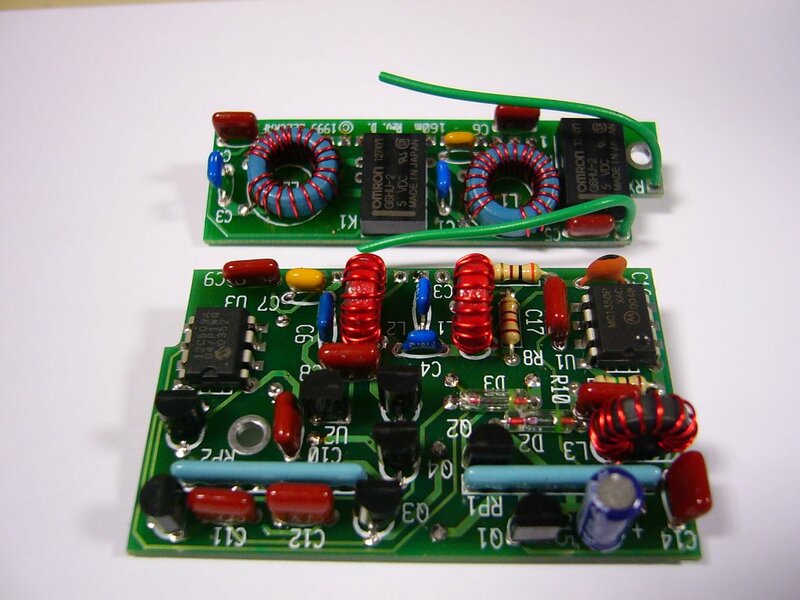 The small pcbs are of similar fine quality to those used by Elecraft. I decided to add the capabilty of data modes to the K2, although I have no real idea why. In 2005, I made a total of 1385 QSOs, of which 1376 were on CW, 6 on RTTY, 2 on PSK and only one on SSB (to work a local club event), so this hardly justified even buying the KSB2 option. Nevertheless, I built W3FPR's audio amplifier and mounted it on a standoff from the Logic Board. I also built a box to interface the K2 to a computer or possible microphone. Implementing data modes on my K2 is still a work in progress and is quite low priority due to lack of sufficient enthusiasm. 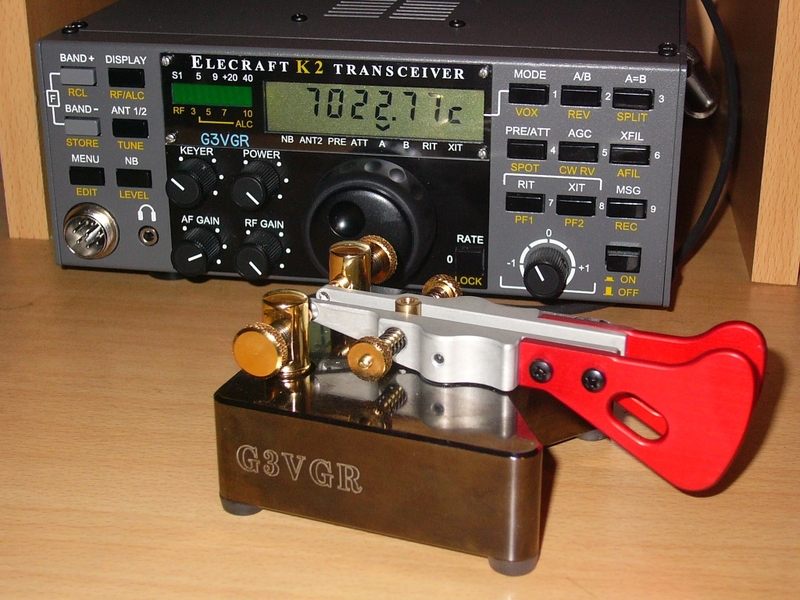 The rig is a great QSK CW performer, and I no longer use any other modes. A really worthwhile acquisition was a K6XX CW zero-beat indicator from WA3WSJ. 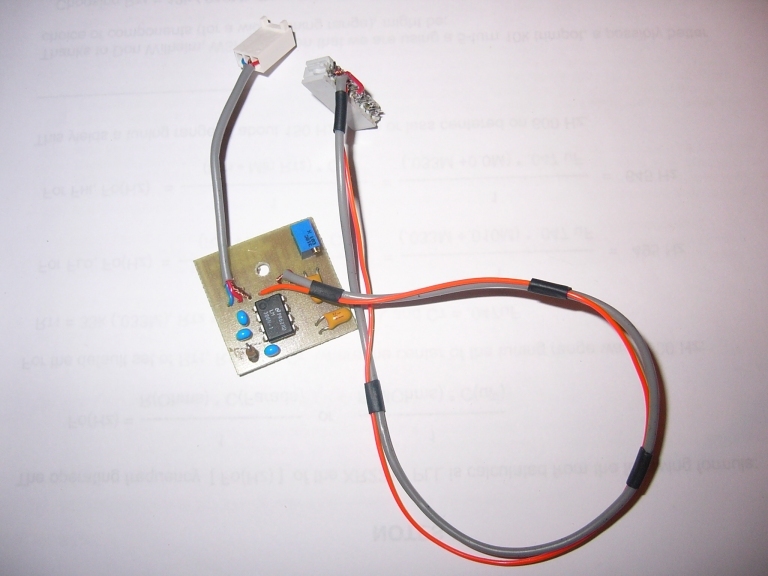 This is a SMD kit already assembled by Ed and cost just $35, including shipping. 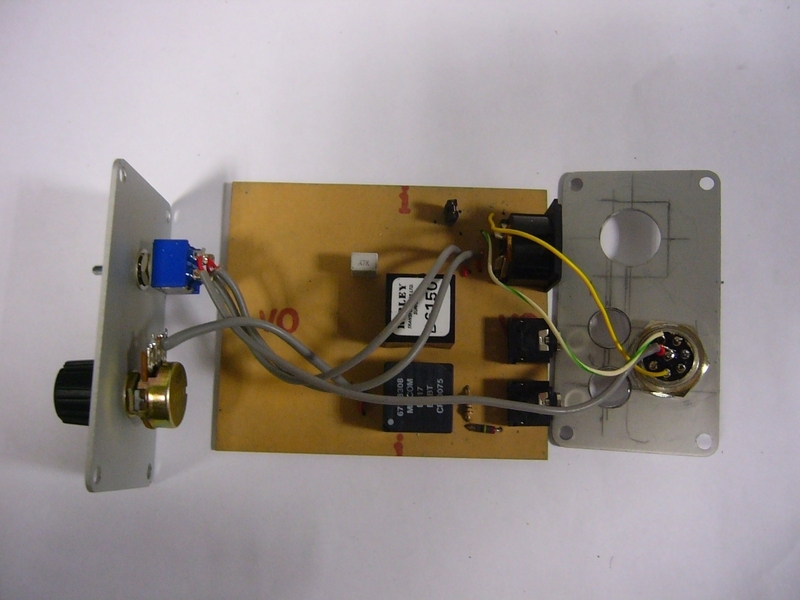 To install it just requires connecting 4 wires to the front panel and it will illuminate the rightmost segment on the S-Meter barcode display when exactly zero-beated with a signal. 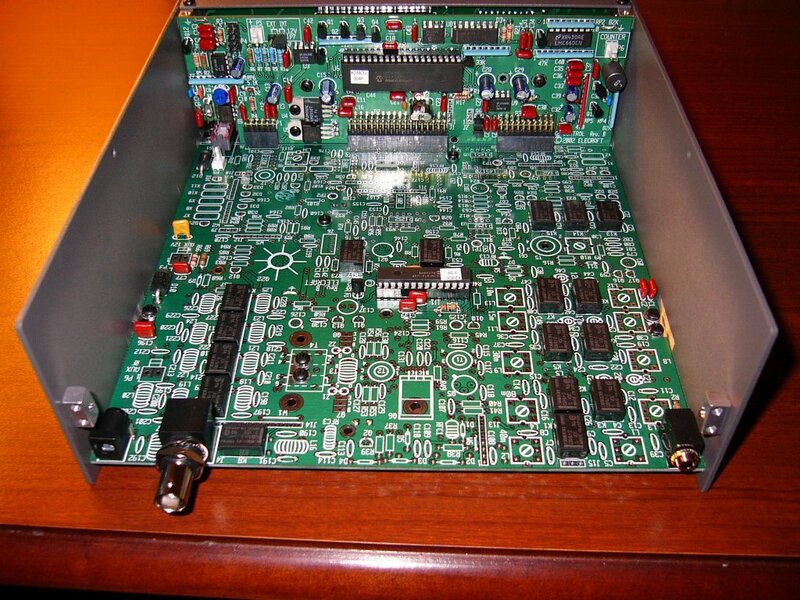 I glued the assembled PCB to the Front Panel PCB with epoxy and adjusted the tiny trimpot to peak at 700Hz. The led illuminated somewhat randomly, so I installed a 51K resistor in series with the AF input to the PCB and now it works well, enabling me to net precisely. It's a pity that many people who call me seem to be unable to net. After using the rig for just over a year since the last modifications were made, I was itching to take off the covers again. 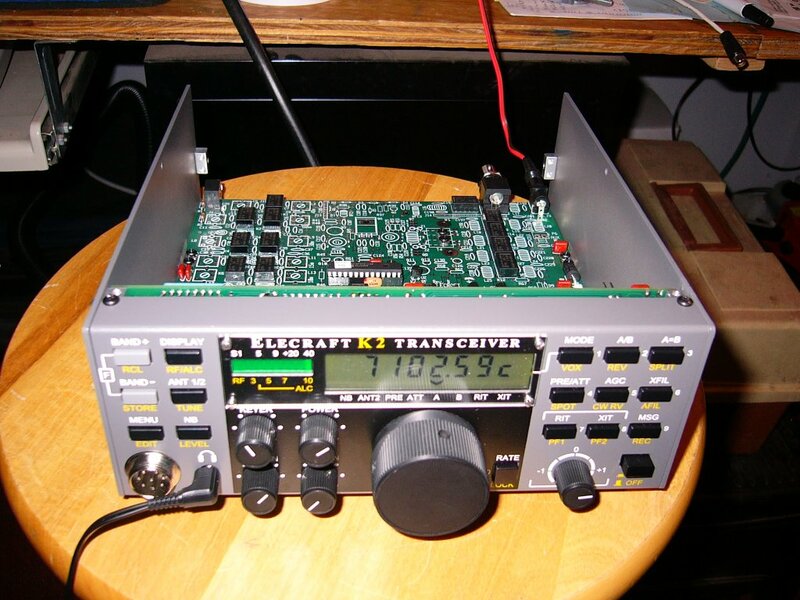 So in November 2007, I installed 2 small, but effective mods from G4BJM. 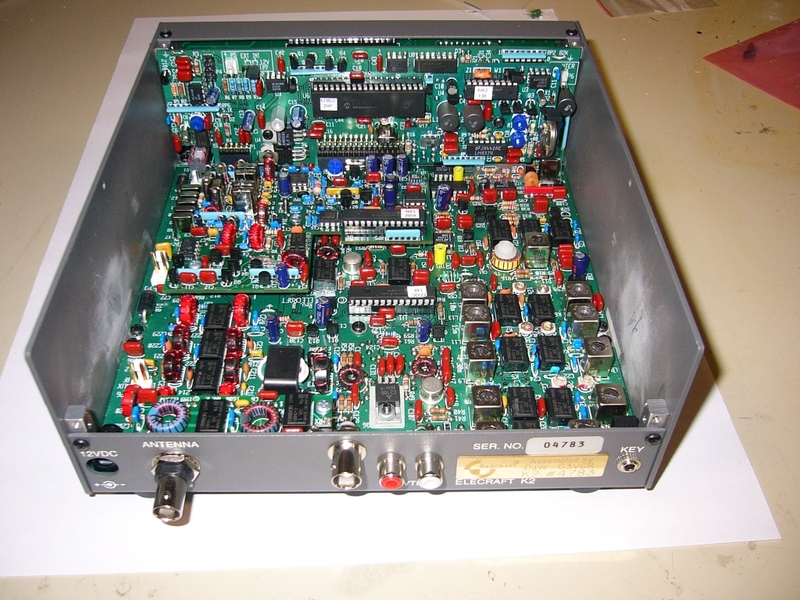 One mod to the KAF2 increased AF gain and the other, to the Control Board, improved the QSK capability. 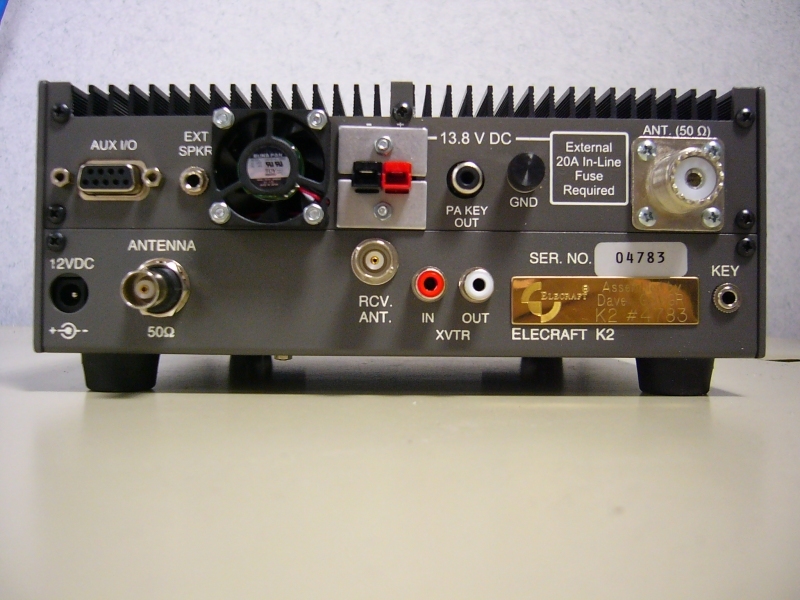 The next plan for my K2 is to experiment with a Softrock SDR as an outboard Q5'er. This involves adding a buffer amplifier to the IF chain and could come in useful when the sunspots return and the HF bands become busier. 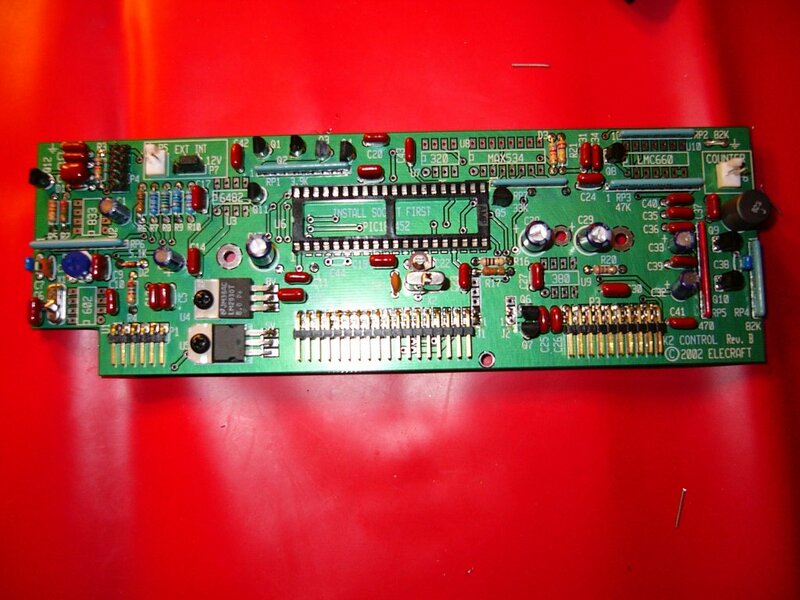 There're also a few more components fitted on the underside of the RF board. 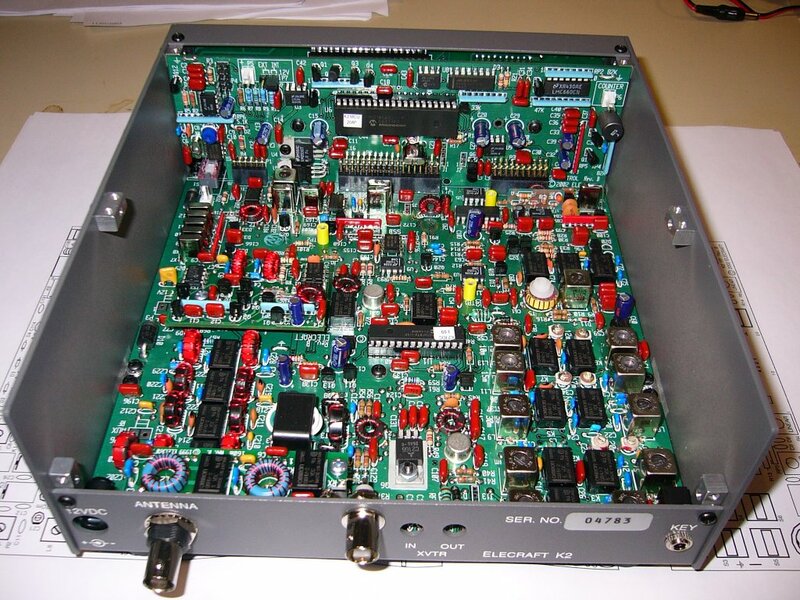 The 2 PA transistors can be seen at the front of the picture. 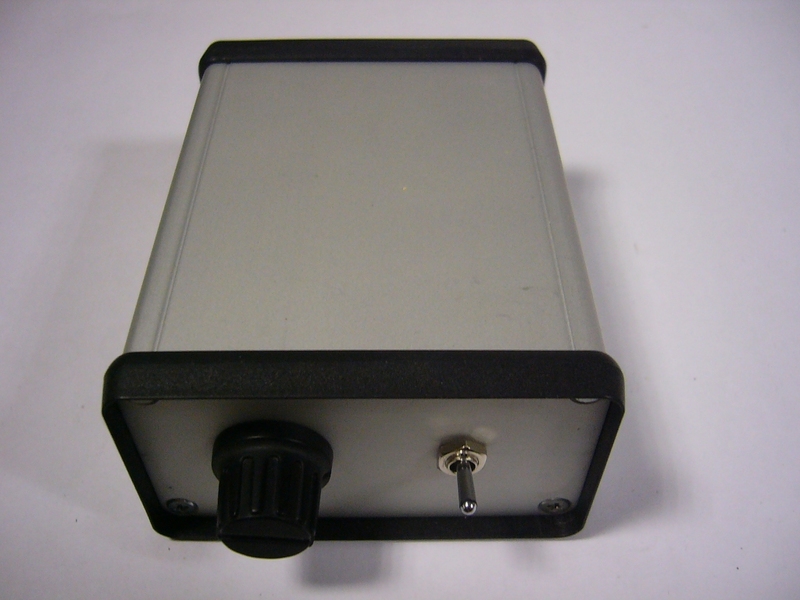 The completed datamodes box. It just needs painting and some labels applied.